With the above skills we have had the opportunity to work on restaurants, offices and retail stores in addition to designing some of the most interesting and fascinating homes in El Dorado County, Amador County, Placer County and Sacramento County. Another specialty is the “granny flat” or second residence (limited to 1200 sq. ft.) as allowed per County Standards. We have access to the best structural and civil contractors in the area. 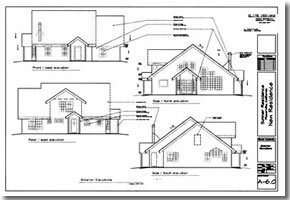 Should your project require an architect, we can provide one at reasonable prices. Our relationships with local building officials at the County and City levels enable your project to proceed smoothly through the building permit process.